COLUMBIA COUNTY/LAKE CITY, FL – On March 21, 2017, City Attorney Fred Koberlein hired the Law Firm of Alan, Norton & Blue (ANB) of Tallahassee to investigate charges by FSU's Diane Scholz that she was insulted, bullied, and manhandled by Lake City City Manager Wendell Johnson. 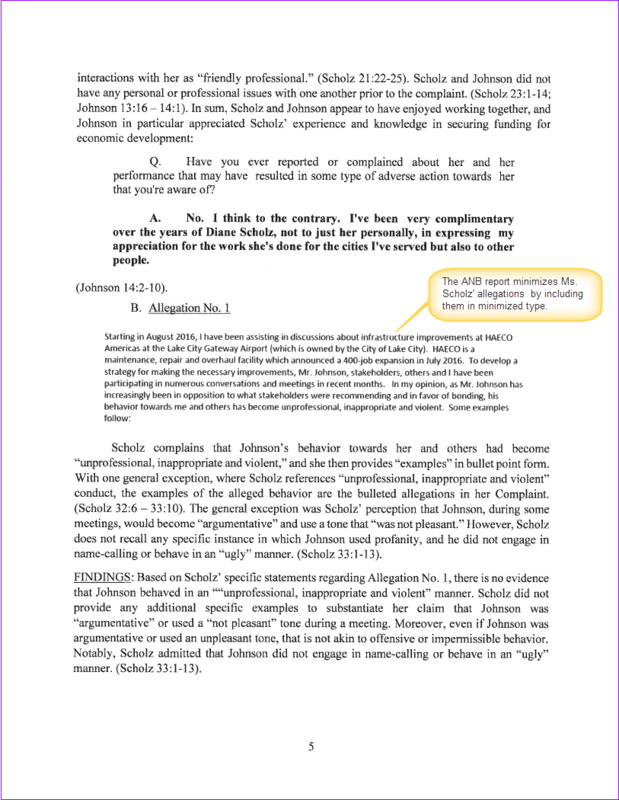 In her March 16 complaint, Ms. Scholz did not threaten legal action, but asked that Mr. Johnson be reprimanded. Mr. Johnson denied all charges. On June 9, ANB cleared Mr. Johnson of any wrongdoing. ANB's investigation cost the City $11,893. ANB took sworn witness statements from the following: FSU's Scholz and Jeff Hendry, the Director of FSU's Institute of Government, Ms. Scholz' direct supervisor; City Manager Johnson; Assistant City Manager Grayson Cason; Airport Manager Roland Luster; City Councilman George Ward; Columbia County Econ Dev Director, Glenn Hunter. Ms. Scholz provided medical reports and pictures of her hand, which she claimed was injured by City Manager Johnson. According to ANB, Ms. Scholz was interviewed on April 3, 2017. On April 5 ANB was "provided video surveillance footage of the rooms of the Lake Shore Hospital Authority" where the meetings took place where Ms. Scholz' hand was allegedly injured. The ANB report leaves out how the video footage was obtained. An examination of Hospital Authority public record requests does not include any request for the "video surveillance footage." ANB's invoicing does not indicate any charges for the video. City Attorney Fred Koberlein is the attorney for the Authority. ANB claims it did not show the video to any of the deponents. In relevant part Ms. Scholz wrote: "Starting in August 2016, I have been assisting in discussions about infrastructure improvements at HAECO Americas at the Lake City Gateway Airport... In my opinion, as Mr. Johnson has increasingly been in opposition to what stakeholders were recommending and in favor of bonding, his behavior towards me and others has become unprofessional, inappropriate and violent." In her witness statement, Ms. Scholz explained that when Mr. Johnson was in Clewiston, "he shared with me that he had a difficult relationship with Enterprise Florida." "Based on Scholz’ specific statements regarding the allegation, there is no evidence that Johnson behaved in an “unprofessional, inappropriate and violent” manner... even if Johnson was argumentative or used an unpleasant tone, that is not akin to offensive or impermissible behavior." 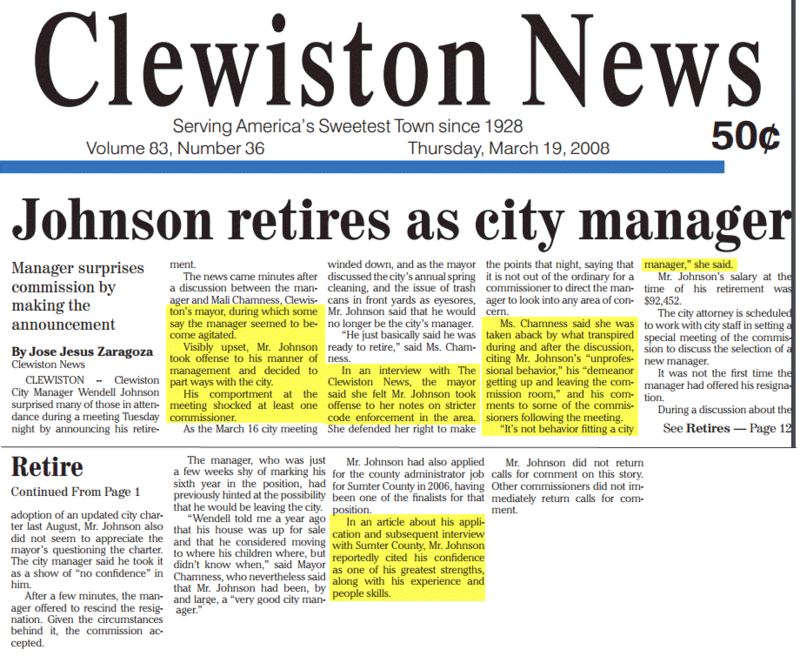 In 2008, the Clewiston News reported Mr. Johnson suddenly retired during a City Council meeting. Read the Clewiston News report here. On July 6, 2009, LC hired Mr. Johnson. Alleged: Mr. Johnson Called Ms. Scholz "Hillbilly Girl"
None of the witnesses recalled hearing Mr. Johnson calling Ms. Scholz "Hillbilly Girl," other than Councilman Ward who said, "I do think I have heard him call her hillbilly girl, but he told me at the time he said that that goes back 20 years... they've known each other 20 years. And he said they joked back and forth and he's called her hillbilly girl. I don't know if she didn't like it the entire time and never told him or if she was trying to make this as a slur at that point in time, that I don't know." Mr. Johnson does not recall calling Ms. Scholz "Hillbilly Girl." Mr. Johnson said, ”I never -- I never -- I would say that I would not walk into a meeting and just look at her and say -- call her a hillbilly girl. I would not do that." Ms. Scholz said about the incident, "And he just walked in and said, "hey, hillbilly girl." And I'm like -- I'm thinking, what in the world? But, you know, it's no -- it wasn't anything that really, I guess you'd say insulted me. I just thought it was bizarre and ignored him. I didn't react." ANB's report did not mention Councilman Ward's statement. ANB wrote, "Even if Johnson did make the comment, there is no evidence that he meant to offend or harass Scholz." Ms. Scholz complained: "During a meeting with Glenn Hunter (Director for the Columbia County Economic Development Department), City Councilman George Ward (who is the designated Councilman to oversee the airport) and me, Mr. Johnson burst in shaking, stuttering and red-faced... Mr. Johnson then began yelling and screaming at Mr. Hunter and me, accusing us of going over his head and speaking with his boss and blaming him for things being a mess..."
Ms. Scholz did not say Mr. Johnson used profanity, yet ANB harped on this point with the witnesses. 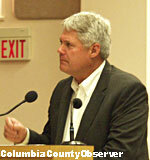 Your reporter has been interacting with Mr. Johnson since 2008, when he arrived in Lake City. While Mr. Johnson may get close to the edge, and occasionally drift to the other side, your reporter has never heard Mr. Johnson use profanity – once. Councilman Ward said, "In dealing with Mr. Johnson over the past several years that he's been here, he's very passionate about what he does... And he does have a little bit of what I call a banty rooster attitude sometimes... All of council has seen that side of him. It's not always attractive, but he – he does get the job done." Econ Dev Dir Hunter said about the meeting, "The door was open and Wendell came in the door. It was late in the afternoon and he was very excited. He was very red faced. He was pointing his finger at me, directing everything at me..."
Mr. Hunter continued, saying that Councilman Ward told Mr. Johnson, "You're going to have to calm down. You are going to have to leave." Both Mr. Ward and Mr. Hunter thought that Ms. Scholz exaggerated the time of the incident. Ms. Scholz said 10-15 minutes. Mr. Ward had the exchange lasting 5-7 minutes and Mr. Hunter was at 3-5 minutes. Recounting his version of the incident, Mr. Johnson said, "I did not yell and scream. Yes, I was firm and they definitely knew I was angry. I own that. But I was not yelling and screaming. I was not in a blooming fit of rage." Lake City Airport Manager, Roland Luster, on hearing of the event, recommended that Mr. Johnson extend an "olive branch" to both Ms. Scholz and Mr. Hunter. Mr. Johnson took the advice and extended the branch a couple of days later. "Ward and Hunter confirm that Scholz’ Complaint is a fairly accurate description of the meeting." The ANB report reported that at another meeting Mr. Johnson "approached them, separately, to ensure that they would continue to have a healthy working relationship." Alleged: Mr. Johnson called Ms. Scholz and "Old Dog"
According to Ms. Scholz, at another meeting Mr. Johnson "referred to himself and I [sic] as "old dogs" and I told him, "Speak for yourself!" Mr. Johnson said, "I don't know if I said it or not... If I referred to us as old dogs, I did not do it or intend it in any way to be derogatory." While it is clear that Mr. Johnson knows municipal finance, calling a woman an "old dog" in most circles would not be considered a term of endearment. The ANB report defended City Manager Johnson, "Although Johnson may have made this remark, it does not rise to the level of bullying or actionable harassment." The bullying remark in the ANB report refers to the undenied contention that Mr. Johnson kept asking Ms. Scholz the same question over and over. Ms. Scholz said that she felt bullied. Alleged: Mr. Johnson Hurt Ms. Scholz' Hand When Shaking it. On March 8, 2017, Mr. Hendry and I attended a HAECO Transportation & Training Issues meeting at Mr. Hunter's office. Before the meeting began, Mr. Johnson was shaking hands with people in the room. He approached me and reached his hand out to me. I held my hand out to shake, but instead of shaking my hand, he grasped my right hand and twisted it as hard as he could. He then quickly moved on. I was in pain, speechless and stunned by his action. It was time to take our seats so there was no opportunity for me to tell anyone what had happened. I sat there with my hand swelling, tingling, turning cold then numb. Later, after the meeting ended, I told Councilman Ward about Mr. Johnson calling me names, yelling and screaming at me and injuring my hand. I told Councilman Ward that I intended on filing a complaint and he replied, "You should file a complaint". I walked away to say good bye to other attendees. Mr. Johnson began shaking people's hands. When he got to me and held his hand out, I told him I was not shaking his hand because he had hurt my hand earlier. I wasn't shouting, but I spoke loud enough that others nearby heard me. I then walked away. During his statement, Mr. Johnson said that Ms. Scholz brought up the issue of "handshake" and that she would not shake hands with him at the end of the meeting, telling him that he had hurt her before. Mr. Johnson said he was "dumbfounded." ANB states that on April 5 they received Lake Shore Hospital Authority Video of the meeting rooms in which the handshake and its aftermath took place. ANB has not revealed who provided the video. April 6, 2017, when Mr. Johnson gave his witness statement, he was not asked if he had seen the video. He was told that ANB would not show it to him. City Attorney Fred Koberlein is also the Lake Shore Hospital Authority Attorney. The Authority public record request log is absent of any request for video surveillance from the Authority. In the past, Authority Manager Jackson P. "Jack" Berry claimed that he could not produce videos in house and the production of those would require an extraordinary charge. For a short video of a few minutes by the Authority courtesy window, Mr. Berry wanted to charge $214.36. The Authority record of expenditures from March 2017 – June 2017 does not show any payments for videos or extraordinary IT charges. ANB's $11,893 invoice does not show any charges for video. There are claims and counter claims regarding how much Ms. Scholz was using her right hand after the alleged incident. Ms Scholz provided photos of her hand, taken the day after the purported handshaking incident which shows that her hand had swollen up. She also provided medical records of her trip to the emergency room and a doctor's report which said her hand been injured. In connection with her Complaint, Scholz provided medical records corresponding to her right hand and wrist as well as several photographs that she and her husband took of her hands the evening of March 8, 2017. [the day after the alleged incident] (Appendix, Attachment 2). The belated photographs, however, are not as probative as the contemporaneous surveillance video footage. In the photographs, Scholz’ right hand is not discernibly swollen or, for lack of a better term, different than her left hand. These are three of the photographs in which ANB claims there is no difference between Ms. Scholz' left and right hand. They were taken the day after the incident. The ANB report concludes: "no reasonable person would find Johnson’s conduct or statements to be objectively offensive, inappropriate, or unprofessional."